Mountain biking, surfing, snowboarding... GoPro cameras are excellent at capturing spectacular video with amazing visual quality. With the MKE 2 elements Action Mic you now have a rugged solution at your hands that enables you to capture the thrill of the moment in a sound quality that is just as incredible. Featuring great Sennheiser technology, made fit for the most extreme situations a mic can face, the MKE 2 elements Action Mic will help you tell the whole tale. Plug it in….aaaand: Action! Brilliant audio adds that extra something to your video when you really want to mesmerize the audience. 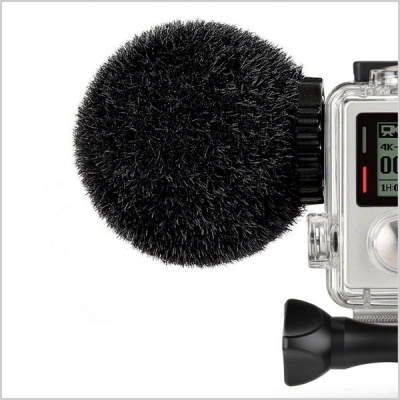 With GoPro recordings, whose images can be especially involving, an audio upgrade throws the viewer right into the action. Using the MKE 2 elements Action Mic you can now add exactly what has been missing to make a real professional and lasting impression: great audio – in legendary Sennheiser quality. It is the upgrade you have been waiting for. Look at a video with the speakers muted and you realize: It’s the sound that really takes you there. The breathing of an athlete, the roaring of a breaking wave, the grit under the tires of a mountain bike. With the MKE 2 elements Action Mic you can capture all that. Clear, crisp, contoured. Conveying not only the picture but the emotion and the atmosphere. There are experiences and places off the beaten path, which are actually just as much about their unusual sounds as they are about the fascinating pictures. With the MKE 2 elements Action Mic you can now put them on your Go Pro bucket list. Because with this sophisticated recording device on-the-go recordings that require great quality audio are now an option. Water is not an issue. 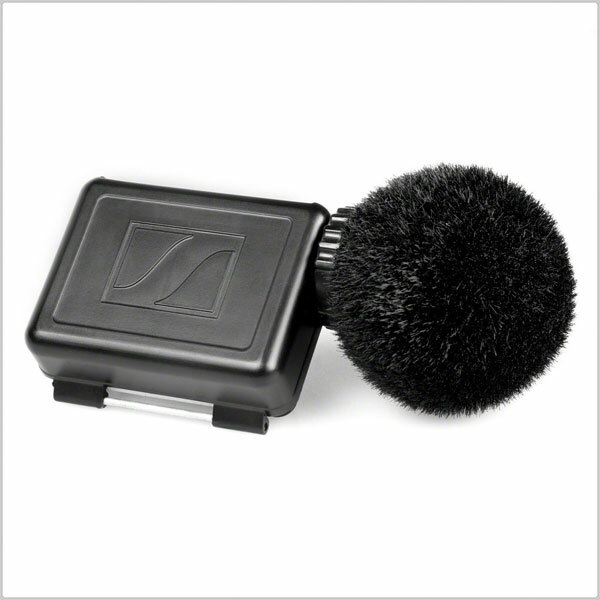 The MKE 2 elements Action Mic can cope with up to 1 bar of pressure. And even though recordings under water are not possible, it will be ready the very moment it resurfaces. 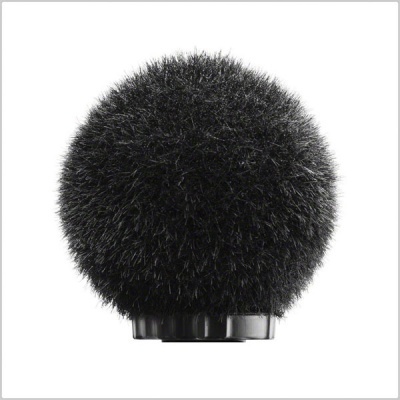 So, don’t worry about your MKE 2 elements Action Mic. You can take it anywhere your GoPro will go. 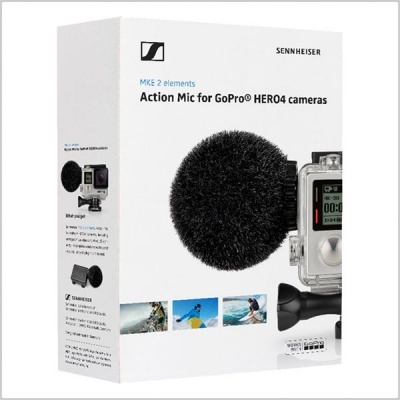 Just connect MKE 2 elements Action Mic with the Sennheiser custom-made BacPac Backdoor to your GoPro and you're good to go. 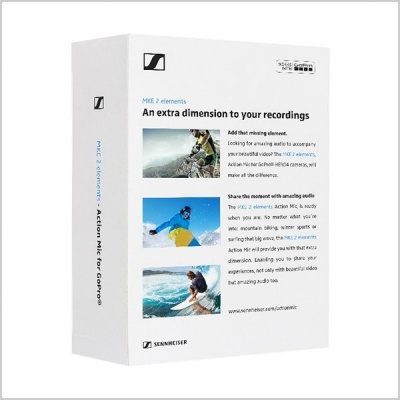 The superior sound quality of Sennheiser is now available for your GoPro videos. As the the MKE 2 elements Action Mic connects seamlessly to the GoPro original housing, you have a complete and waterproof solution at your hands. Allowing you to focus on the task ahead. Getting into the action and capturing the thrill of the moment.